My name is Roxan and my Dad is named Gerry. 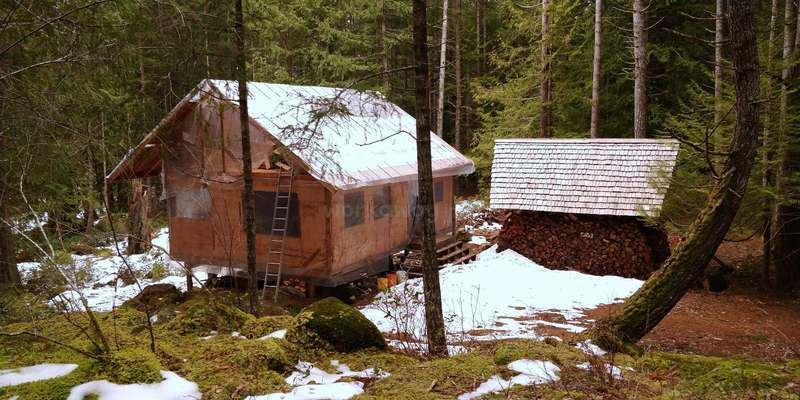 Our life-goal at the moment is to build a house and a small cabin that are completely off-grid and almost completely self-sustaining using innovative ideas and materials at hand. We live on beautiful Lasqueti Island, one of the more rural Gulf Islands in British Columbia. Here you will find an island that lives completely off-grid, no paved roads, no police, a strong sense of community, one small convenience store, one bar/restaurant/hotel/gas station all rolled into one, one Free Store, multiple cookie-stands run on the self-serve honor system, an arts center, eccentric characters, feral sheep, wild deer, billions of stars, gardens galore, houses and structures made in all shapes and forms by all different types of materials. Its an island to learn from, and to share your knowledge. We would appreciate any help anybody has to offer and we are always looking for ideas of how to improve our structures, our ways of living, etc. We hope that it would be a mutual exchange of knowledge and wisdom. Additional summer 2019 shifts will be announced soon. Contact us for additional details; our hosting system is somewhat unusual. Please read our profile carefully, including our feedback, before making your decision to come to Lasqueti Island. Most recent arrivals to Lasqueti Island instantly love our little island... or instantly don't like it. It all depends on the type of person you are. And you know yourself the best. The cultural Exchange on Lasqueti Island is definitely a worthwhile one. The community is very strong and people are always doing interesting things, willing to help you out, willing to teach, willing to share. There are plenty events at the Community Hall, and music, arts and crafts, etc. In the summer months, play Ultimate: a frizbee game of running and catching a flying disc. From our land, a volunteer could learn to build simple structures out of re-purposed/recycled materials, learn to live life off-grid, learn about different modes of gathering energy, get closer to nature, learn to identify the different types of wood and lumber in the Pacific Northwest, learn about beach-combing and boating, learn how to hand-split cedar shakes, how to install shakes, learn about organic gardening, etc. Learn that a fun, healthy, and entertaining life is available without the use of money. We own 10 acres of prime Pacific Northwest land and we try our best to tread lightly and keep it in a close-to natural state. Most of our building work is done by human-power, which means no big digging machines scarring the earth. Humans will do lots of wheel-barrowing, shovel-digging, wood chopping activitiies. In particular, we are looking for people that can split firewood with an axe, use a wheelbarrow to move the split firewood, and finally stack the firewood in the designated location. Your level of 'attention to detail' and ability to follow simple instructions may determine your fate and length of stay. We also have a large garden that we maintain throughout the year and are constantly looking for ways to maximize our crops and for different types of fruits and vegetables to plant, etc. Watering the garden and harvesting vegitables to eat is a common activity. Cooking is another skill that is useful here. We have primitive cooking facilities (woodstove top and two propane burners) and we try to eat as much as possible from the garden. This may require getting creative with meals (mostly vegetarian). Most of our days are easy going and simple. Wake up when the sun rises to be in tune with nature, eat breakfast, work for a couple of hours, take an hour for lunch, then a few more hours of work in the afternoon. Then relax for the evening and dinner. Afterwards, explore the island and participate in community events. 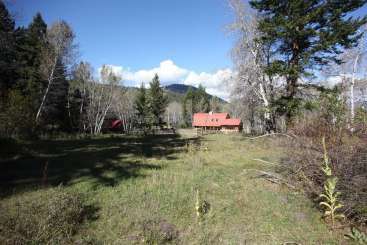 Or, if you prefer, enjoy the solitude and seclusion of the surrounding forest. This is our fifth year of hosting WorkAwayers! So far we have hosted over 85 WorkAwayers from many countries around the world. We had many wondrous and joyous experiences with almost all of the WorkAwayers we hosted, and even developed some great long-lasting friendships in the process. We have rooms in rustic cabins, and we also have plenty of quiet spots on the ground for tents. As for a bathroom, we have an outhouse and a shower (cold water only). There's hot showers nearby, in case you can't handle the cold water. As mentioned, there are plenty of things to do on Lasqueti. Lots of beaches to swim at, farmers market on saturdays, community sports teams, playing ultimate, saunas, draping (contact dancing), hiking, beachcombing, caving, island social events, etc. 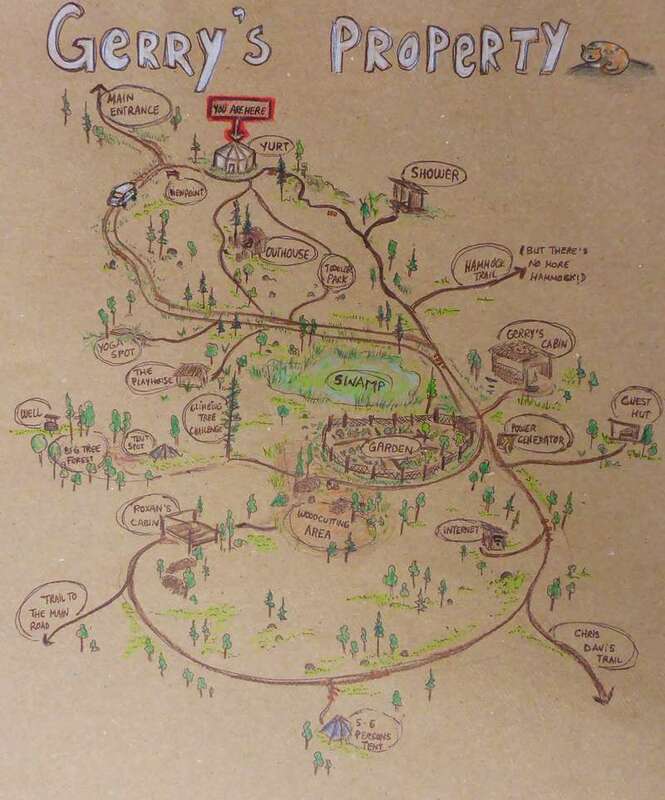 Map of Gerry's Property - hand drawn by Justine of Quebec. Roxan and her dad, Gerry, on their way back from gathering Styrofoam to be used as home insulation. This passive-solar house, currently under construction, will warm itself using the heat of the sun. During the summer, the house will also cool itself using the heat of the sun. How? 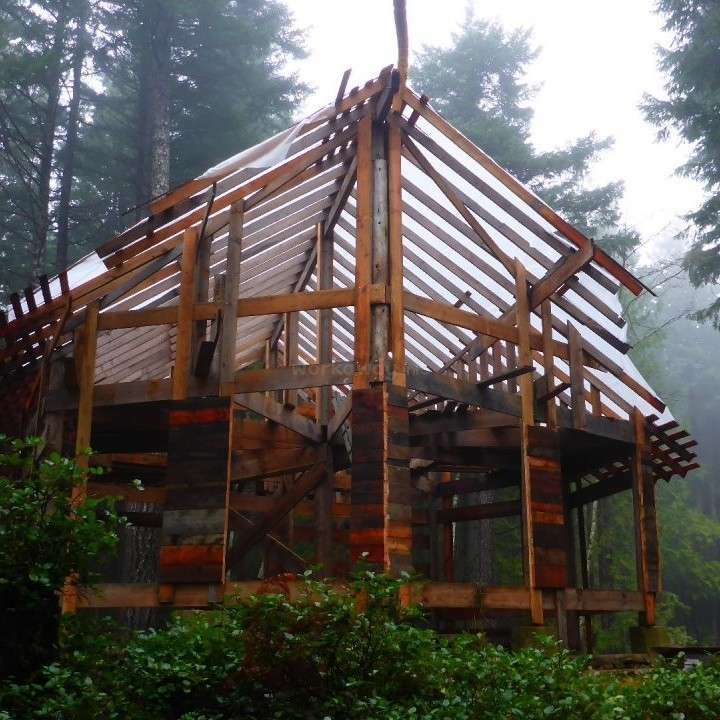 Join us in the construction of this unique off-grid home and find out. This yurt-like structure is used as a lounge, kitchen, dining room and games room. 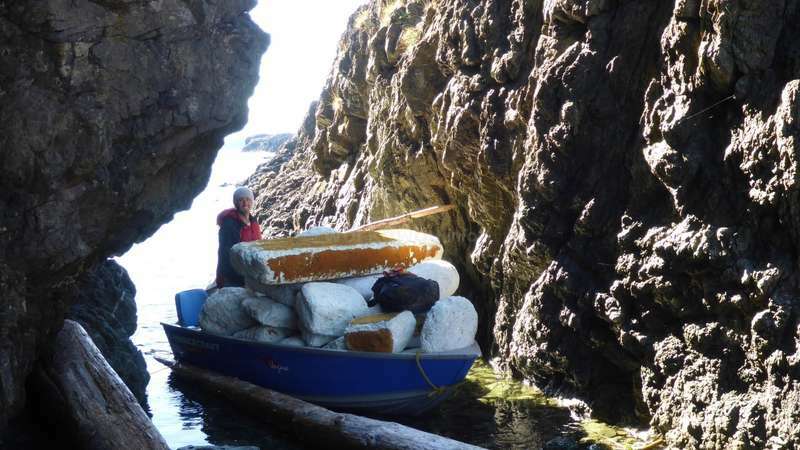 Gathering Styrofoam for insulating our cabin and home cleans the shoreline at the same time. Chainsawing round after round after round of high quality Douglas Fir firewood is only part of the fun. 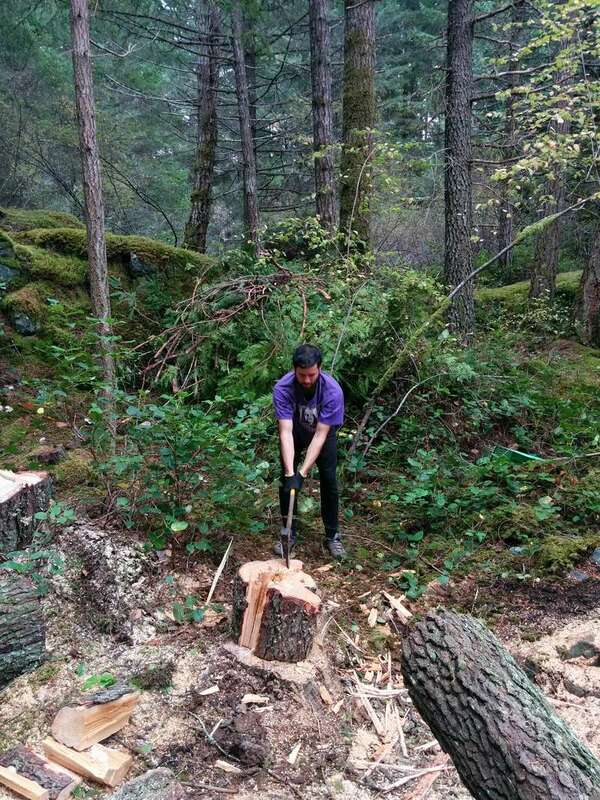 Chopping round after round after round of firewood using a 4.5 pound Arvika splitting axe. Classic! Help us plant, harvest, prepare, and eat organic fruit and vegetables from the self-watering garden. Human power is better than machine power - dragging beams harvested from blow-down trees nearby. I only spent a short time on Lasqueti Island but it seems an intriguing place, well worth a visit. Roxan wasn't there so I worked only with Gerry, who is easy going and relaxed about work. If you are looking for lots to do this probably isn't the place for you, the workload was enjoyable but very light. I was hoping to learn lots of building… read more skills using off-grid methods and we did start constructing a woodshed which I loved but I would have liked to get a bit more done. However I did do a range of tasks like chopping firewood and dismantling some trailers, and Gerry took me out on his boat to get guitar wood which was a great experience. You need to be able to cook here with limited ingredients. If you have your own bedding too bring it; as the profile states there are various outdoor options for sleeping and in the fall it started getting pretty cold out there, even with all the blankets Gerry provided. The property is rustic but beautiful, and surrounded by peaceful stunning woodland. I would have liked to get involved with some more social activities on the island, but as the property is fairly remote and hard to find in the dark I didn't feel able to go on my own and Gerry tends to stay in. I did enjoy my stay but if you are proactive and used to a bit more structure then be aware it is very relaxed here. We hosted Sarah for about a week in early October, 2018. Many of the projects we worked on required teamwork, and Sarah was an essential part of the team. Without her efforts, we could not have accomplished what we needed done. 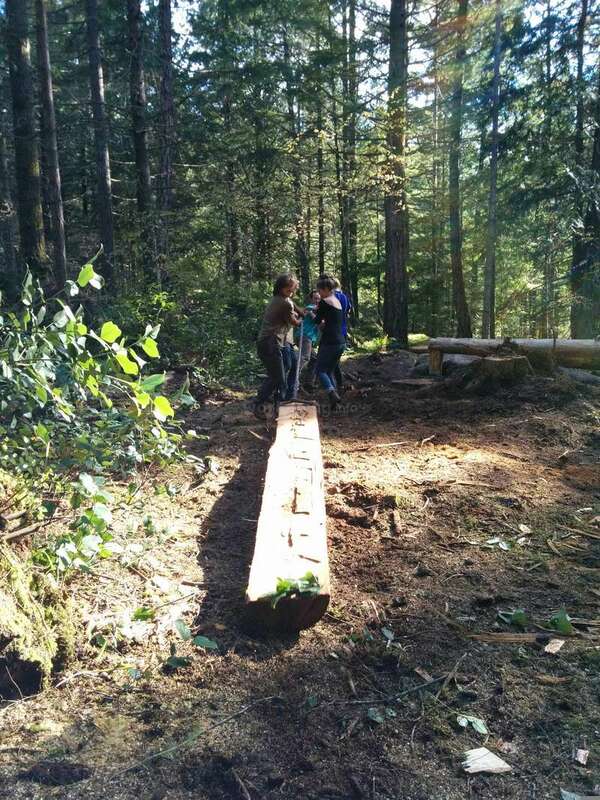 We built a woodshed, moved a lot of cedar shakes, dragged a boat, broke up rusty trailers, and brought back an entire… read more boat-load of red cedar blocks from Texada Island, where we beachcombed them. Sarah got one foot wet. On water and land, we had close encounters with all sorts of wildlife - all friendly, of course. Just like Sarah, from England. Friendly Sarah, is how we will remember her, especially when we see the projects we worked on together, as a team. Team Friendly Sarah. This was the best first time work away experience anyone could have ever asked for. Overall I had a wonderful time learning, exploring, socialising and taking in the nature on the beautiful Lasqueti island. I stayed for 2 weeks and I loved every minute of it. 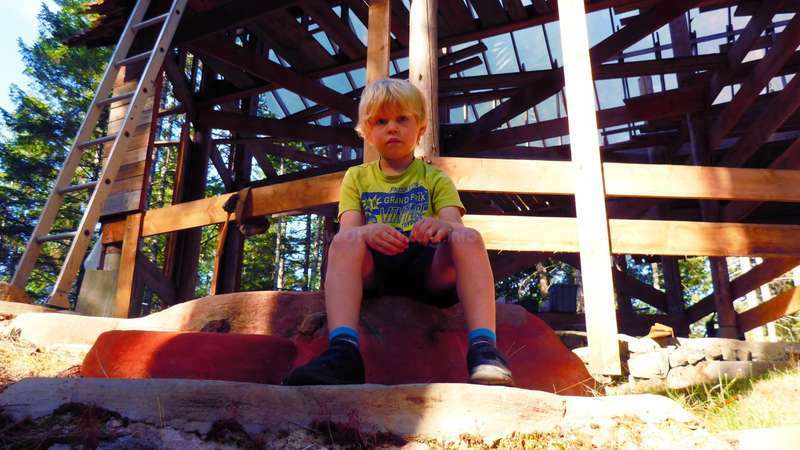 I mainly helped out in their beautiful garden and worked on the fantastically designed… read more cabin Roxan is building. What I liked about the tasks was that I was constantly changing and learning new things everyday. I acquired so many new skills such as nailing, drilling, harvesting, measuring, circular sawing and one of my favourites cutting firewood! Gerry's detailed descriptions never left you unsure about any situation. He is a very good teacher and takes pride in explaining thoroughly so that everything is clear. He is intelligent and is also interested in learning about different cultures. Roxan is friendly, inviting and most of all very patient. She always reassured me and did not rush the learning process. They have had many volunteers come and go so they are very experienced with what they do. While I stayed with them they told me about different things to do around the island if I wanted to, such as markets, wood carving, summer camp, trekking, live music, ultimate frisbee and more. I managed to get the real sense of Laquesti island living by interacting with the locals, who were all fabulous in the one way! If you go with an open mind and you're willing to learn you will love this place as much as I did! Highly recommended! What a great Workawayer! Elizabeth instantly became one of the family and we loved her positive can-do attitude. Also, she really imbibed the culture and joined the community: we believe that Elizabeth was the most social of Workawayers to ever grace our humble island by participating in as many community events as possible. She got to know as… read more many community members as possible and learned their names with interest. By doing this she really made an impression on the whole island, and the whole island will remember her fondly. The whole island misses her and we all hope she returns one day. We think that Elizabeth learned that traveling alone can be very rewarding. 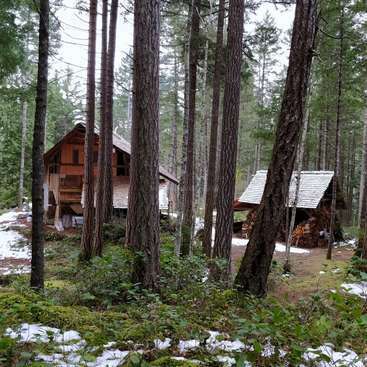 Staying at Gerry's place is the perfect opportunity to experiment what leaving off grid means. Gerry has amazing team building skills and I spent a wonderful time with the other workawayers. We've been included in lasqueti community doing a lot of fun stuff and I am very grateful for the knowledge about wood house building I learnt through both… read more Gerry and his daughter Roxan. I spent 2 weeks with Gerry in the Lasquetian forest and learnt so much! We spent 3 days beachcombing the coast for cedar logs that Gerry then showed me how to split into shakes for the roof. I spent a lot of time in the garden watering and planting as it had been very dry. I even cut down nettles and brewed some compost tea!! Although there was no… read more running hot water at his cabin there are public showers to use downtown which is about a 30min cycle away and I’d reccommend stopping by the cookie stand on the way back!! We were absolutely delighted to host Hazel for about two weeks during May of 2018. She's one of the best workawayers we have ever hosted, if not THE best. Hazel was always at least 10 steps ahead of us at all times, anticipating what we needed her to do even before we thought of it. Amazing! We are hesitant to recommend her, but only because we… read more want to host her again, and want to keep her all to ourselves! Honestly, if you get the chance to host Hazel... Take the chance! Hazel is definitely a workawayer that made her mark and will be fondly remembered forever. Well done Hazel, and good luck on the west coast Trail. I had a great stay with gerry and it was exactly what I was looking for! After a month in the city this quiet 10 acres of second growth forest was the peace and tranquility I needed. 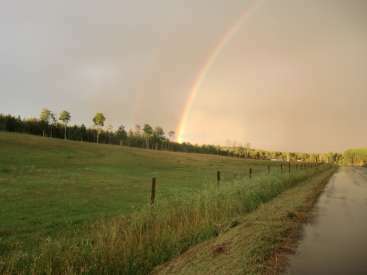 Gerrys land is healthy well kept and a pleasure to walk around, meditate in and just sit and look at. Gerry is a welcoming, interesting and knowledgeable man and I… read more enjoyed his company a lot with Val who was also staying. We worked hard and achieved a lot and in return we ate food until you need to lie down...and then popcorn on top! I've found a new love of dominoes and even managed to win some. I feel like I will be back to the island...cheers Gerry...hope your staying out of this snow! Pete (Jordie Pete) stayed with us for 12 days in March of 2018 and I believe he found what he was looking for; peace and tranquility in a secluded forest setting. As stated in his WorkAway profile, Pete really is 'neat and tidy'. Add to that; well spoken, well-educated, polite, a bit posh-sounding, all with a relaxed attitude (but still very… read more productive). Not only that, and best of all, he is proficient with a chainsaw; a skill that is VERY rare among the many young town-and-city-dwelling WorkAwayers. 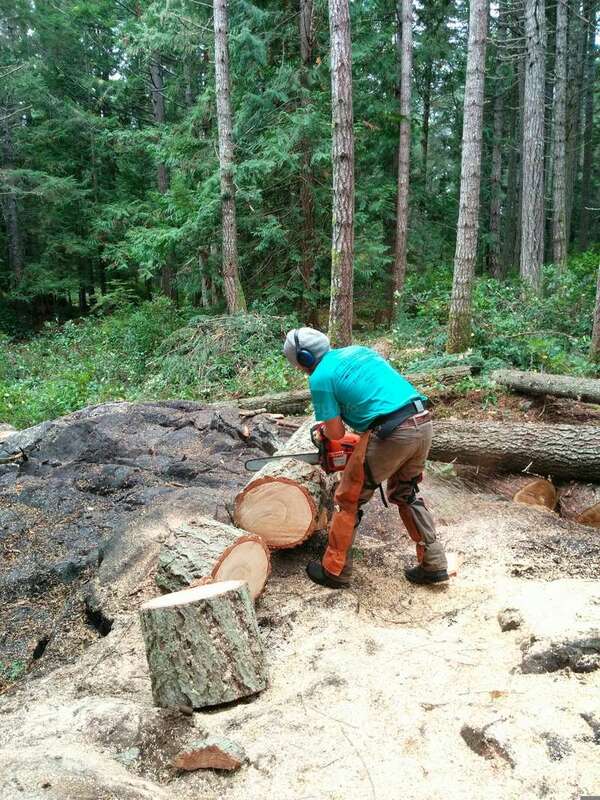 Pete safely fell fairly large douglas fir trees, bucked them up into firewood lengths, and performed many other difficult and tricky chainsaw tasks. Pete was the cornerstone of one of the most-productive crews of WorkAwayers we have ever hosted. If there was an award for 'WorkAwayer of the Year', we would nominate Pete - and he would have a good chance of winning! Well done Pete, and continue to stay away from those pork scratchings. 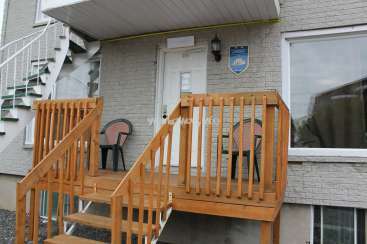 I just spend two weeks at gerry's place and it was so far one of the best experience I had in my life, Gerry is a really nice guy, funny, provide you good food and nice entertainement! We spend every evening talking about the lasqueti pleasures and all those crazy stories about the people living on the island (beware of drapers). The work here… read more isn't to hard at all, +/- 5 hours a day, keep you in shape, and we still had plenty of free time to explore the island etc. Sleeping outside without even a tent, deep into the forest was a really crazy experience, and a real challenge for me, put me out of my confort zone, wich is what I was looking for, I learned so much more in two weeks that I would ever have in a year in the city. Hope I will be able to come back one day! Good luck with the building of your house Gerry! We hosted Val for 12 days in March of 2018 and we believe he found what he was looking for: to learn what it is really like to live off-grid. Val was a great team member of one of the most-productive WorkAwayer crews we ever hosted. Val has a very valuable skill that seems to be very rare these days; to complete projects (without complaining,… read more whining, or balking) that are neither glamorous, interesting, inspiring nor clean. Val got the job done and moved on to the next assignment. We were instantly impressed by Val and he was soon promoted to the prestigious and important position of 'Water Manager'. His WorkAwayer crew even spent the night on the top of Lasqueti Island's highest mountain peak; Mount Trematon - without a tent! That's brave and adventurous night-ops for a winter during March in Canada. Good luck on your journey Val. Morag (Mogar) impressed us so much that we urge her to be less modest in her WorkAway profile! Bubbly, funny, quirky, hard-working, Morag was a pleasure to host. She's never without something to say, which we loved and enjoyed her rich conversations, any time of day or night. Morag is bursting with energy and we were lucky enough to benefit from… read more her incredible efforts. And she was, without a doubt, the best Water Manager that has ever graced our humble shores. She set the bar very, very high for future Water Managers to strive to equal. Well done Morag! We sincerely hope that she returns one day. In the meantime, Morag, please say 'hi' to Katy (Perry) if you see here in Winnipeg, Manitoba. It was delightful to host Caitie and Monika! They both joined in with the crew wonderfully, playing cards, working on projects, meal preparation, everything! And WOW! They got a lot of work done! They helped up finish off so many urgent projects that we were almost left with nothing to do! Both Caitie and Monika are organized and meticulous… read more people, and they both gave each and every project assigned to them lots of care and attention. They met all challenges with zest and ambition and even passed the Jenkins Bay Trek Test with flying colors. Ultimate, saunas, Halloween, rock-work, digging, gardening... everything we put in front of them, they soaked it up with enthusiasm. They were lucky enough to enter the 'High Security Zone', a secret location only known to those who dare to enter. We were sorry (and sad) to see these two most-excellent WorkAwayers leave. Maybe they will return one day? We hope so! I really really had a great time with Gerry, Roxane and Sean. They learned me so much: playing ultimate, mud-diging, being a real watermanager, making concrete, being a motorbike chick, gardening, playing hearts, eating popcorn, splitting wood, making a roof... and so much more. They immediately made me feel at home, so thank you for this great… read more experience! Jana stayed with us for 2 weeks in September of 2017. It was a pleasure to host Jana and spend time with her. Her mud-digging skills are exceptional! And her ability with a wheelbarrow... fantastic! We didn't go boating, but went for a motorbike ride to see the huge trees of Mt. Trematon and Jenkins Bay. Jana would make an excellent biker-chick.… read more Well done Jana and good luck on your journey through the Rocky Mountains with your friends. She's a great ultimate player too! 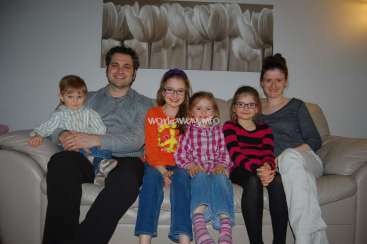 It was a pleasure to host Katie and would not hesitate to host her again. Her mother must be very proud of her! Looking forward to seeing her during the winter. And looking forward to hosting her friend soon too. We will always remember Katie as Katie Perry. Bravo! I spend a week with Gerry on Lasqueti Island and it was truly inspiring! Off-grid is not a joke, and that's what I liked about it. Most of my time I spend working in the garden, expanding the blueberry-production, or maybe I should call them 'Bluegerry', since the host seems to like these berries very much ;) Roxan and Sean helped me discover the… read more rest of the island, and I got the chance to meet interesting and extremely friendly people, much appreciated! 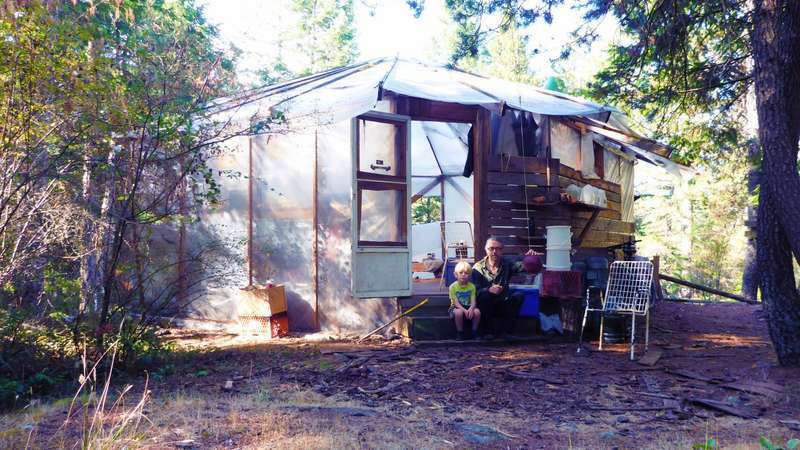 I would recommend this place to everyone who is interested in sustainability and living off the grid. For me personal, I definetely took some ideas with me for the future, and the way I want to live, even though it is not really possible to live off the grid in my home country because there is only one Lasqueti Island! Thanks, Gerry, Roxan and Sean! Paul proved himself to be capable of taking on any task; even ones that were not glamorous and certainly not clean (mud digging). He adapted to nature well and enjoyed what others walked away from in disgust. He's welcome to return anytime, any day, any year. Bravo Paul. You did your country proud! We will think of you every time we eat a… read more delicious blueberry! One of the greatest workaway experiences ever! If you want a dose of off-grid living lasqueti island will surely satisfy. An entire off grid island community offers a unique and refreshing cultural getaway, and Gerry's place is flippin' sweet! 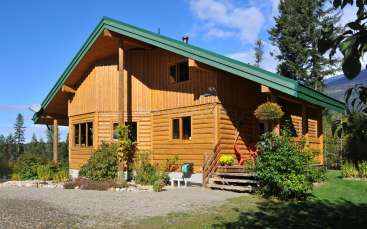 Very tranquil and park-like property with a beautiful garden and forested settings as well. Work is… read more groovy. Adventures are enthralling at times. Great time here, 10/10 hope to return some day! Toby is the new champion of The Climbing Tree! He was able to place the white coat-hanger about a meter from the top of the very-high climbing tree. Not only is he an expert with an axe and can make short-work of even the toughest firewood log, but he survived the shipping disaster of Sangster island: greed for fine woods overtook us and we… read more over-loaded our cedar salvage boat; waves quickly swamped us and we floundered in the sea. Toby did not hesitate or panic when I gave the order to "jettison the load!" and we were saved. Shortly afterwards, Toby successfully navigated the Dog Valley Route via Dead Horse Trail back to home base. Sweet! What a delightful young lady from France! Elisa was always the first one up in the morning, busy with the day's activities. She was quickly promoted to Water Manager, and soon to the Head Gardener position. Even when Elisa defected to The Drapers, we had to forgive her for leaving us with an all-male crew. Edward stayed with us for almost a month in May of 2017. In fact, Ed stayed at our off-grid park-like 'estate' on his own for 15 days while we were away and thus earning the 4 smiley faces rating (Excellent) and was knighted Sir Ed. Not only did Ed get a lot of work done while we were away... but nothing happened! I am sure he enjoyed his 'alone'… read more time. Ed is a wiz at all sorts of things, including installing western red cedar shakes onto a steep roof. We look forward to hearing about Ed's efforts to obtain his own off-grid park-like estate. Every once in a long while a WorkAwayer comes along that we become very attached to, and that we are very sorry to see leave. Taylor was one of those WorkAwayers. From her skills as Water Manager, to her spoon-carving abilities, Taylor never failed to impress us. Taylor's significant integrity quickly earned her a high security rating and she was… read more granted access to the 'high security zone' where few dare enter. She displayed great courage as first-mate on a sea-going adventure, as well as on her solo cave expedition. Taylor is a very capable young lady and will no doubt be very successful at anything she puts her mind to. Even though her wonderful 'essence' still lingers strong, we miss her dearly and hope that she will return one day, joining our little off-grid island community forever. Kitty Kid still wanders back and forth between the Play House and the Taylor Strawberry Patch, searching for her, as if she might be happily skipping through the peaceful green forest somewhere nearby. It was an honor to host Taylor and if there was a higher rating than the four smiley faces (indicating Excellent) we would award it to her. Taylor was our first WorkAwayer of 2017 and she set the bar extremely high for all future WorkAwayers, doing her country, her gender, and her age, very proud. We're not surprised that her friends and family wanted her back so badly, even to the extent that they almost triggered a nomination of her being (possibly) voted off of the island, as per the conditions of her hosting. Well done Taylor! I worked and stayed at Gerry's place for the first two weeks of April 2017 and the experience was genuinely one of the best of my life. If my partner hadn't been all the way back in Michigan, I could have stayed forever. That being said, I plan on dragging him here sometime this summer or fall to see if he loves the island as much as I… read more do. Lasqueti Island is secluded from the "real world" and is therefore very culturally different, at least compared to the places I've lived in the U.S. The majority of the community is tight-knit and laid-back. There are no police and the rules are quite bendy. I found Lasquestians to be some of the friendliest and most generous people I've ever met. My accommodations were beyond satisfactory and I was happy with the work I was given. I learned a lot of cool stuff about Lasqueti, myself, and life in general. I would recommend this host to anyone with an open mind and a willingness to work. My tasks included a lot of digging and wheelbarrowing garden dirt. I also moved and stacked firewood, planted seeds, cooked meals, washed dishes, collected rainwater, swept the floor, and hauled a few small logs from Big Tree Forest to the garden. I was encouraged to take breaks whenever needed and was grateful to have a lot of freedom during work hours. Gerry was extremely understanding and cooperative. He trusted us to work without his supervision and happily answered all questions and concerns. I chose to sleep in one of the covered wooden platforms called The Playhouse which was dry and comfortable even in the wind and rain, with a couple of warm sleeping bags that were graciously lent to me. (P.S.) There are no dangerous wild animals on the island. The animals I saw were sheep, deer, frogs, birds, beavers, otters, chickens, dogs, cats, and some massive slugs. Due to the time of the year, our food supply was not centered around the garden. Our main staples were oatmeal, black and white dried beans, white rice, canned tuna, wheat noodles, white bread, peanut butter, eggs, white flour, vegetable oil, and tomato pasta sauce. 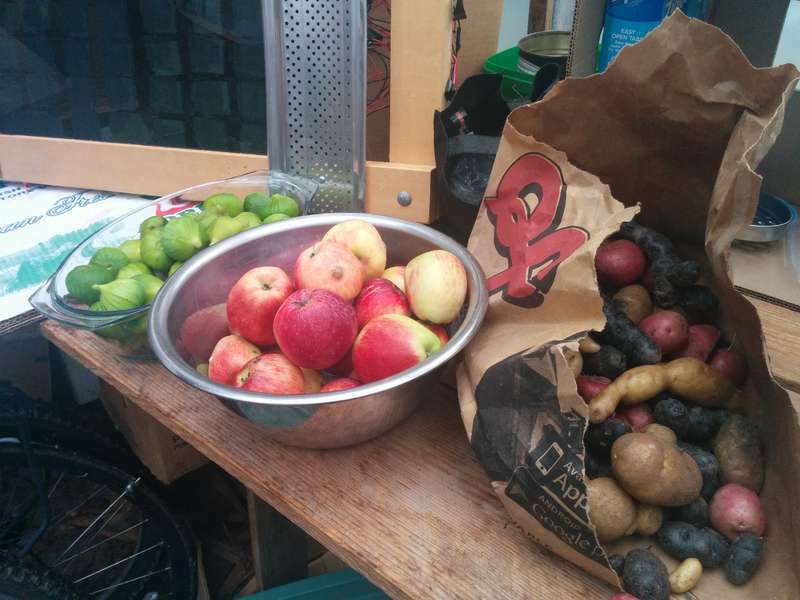 These were supplemented with potatoes, oranges, bananas, yellow onions, cucumbers, tomatoes, carrots, popcorn, and a few parsnips and homemade canned goods from Gerry's neighbor Peter, and cookies from the downtown cookie stand. The seasonings/condiments provided were salt, garlic, parsley, rosemary, mayo, soy sauce, barbecue sauce, stir-fry sauce, and white and brown sugar. Although it was evident that food stores were somewhat limited, we were encouraged to eat "until we felt like lying down on a couch." We were able to make many satisfying meals including potato soup, stir-fry noodles, omelettes with potato pancakes, bean and vegetable soup, spaghetti, etc. If you have any dietary/nutrition concerns, make sure you communicate them to Gerry before you arrange a visit. If you know how to hunt or fish, bring your supplies. Foraging knowledge would be valuable as well. The woods are full of edible mushrooms, Jack pine needles, and other cool things if you know where to find them. From Gerry, I learned how to efficiently chop firewood, to hand-split cedar shakes, to carve cedar burl spoons, to cut and burn old, dry wood rather than fresh "wet" wood, to find and harvest "creamy" red cedar driftwood, to work smarter instead of harder, and (most importantly) to find what you love and go for it. From my solo adventures, I learned that a little alone time is okay, but it is stupid and dangerous to go cave exploring without a buddy or a back-up light source (or extra batteries). From the beautiful people of Lasqueti, I learned that a happy community is a healthy community, sharing is a sure way to make friends, and good neighbors are some of the most valuable things we could hope to have. Come with an open mind and a willingness to learn. Take pride in the work you're asked to do. Adapt to the environment, get involved in the community, meet the neighbors, shake a stranger's hand, go on adventures, ask for help, offer help, ask questions, share what you have, accept what is given, rummage the Free Store, go get a cookie, accept invitations, learn about the First Nations, learn about contact dancing, learn about natural construction and alternative energy, dig for oysters, hike to Mount Trematon. Lasqueti Island is a very special place filled with very special people. Take advantage of every opportunity you have to really experience it. What a nice, and spontaneous, young international couple to host. Harry can tell a very funny story indeed! We are still chuckling to ourselves. However, you may want him to alter the old carpentry saying 'Measure Twice - Cut Once' to 'Measure THRICE - Cut Once'. You might not want to let Harry use your favorite shovel either. It was fun to… read more 'off-grid' with them! Hope to see them again one day. Gerry, Roxan and Sean, thank you so much for everything! That was the forth workaway and the first super off-grid experience. I was impressed many times by you guys' knowledge and skills. Working on the roof, mushroom hunting, smelling woods, fire management, cooking, spending time with all of you guys... I don't know how comfortble I felt. People… read more are doing different kinds of interesting things. I really like this creative island. I'm very looking forward to seeing Gerry's big house and Roxan's cabin! Mayu stayed with us for 2 weeks in September / October of 2016 and what a pleasure it was! Mayu was always 10 steps ahead of us with her helpful and resourcefull nature. She was up for anything and everything, including summiting Mt. Trematon, the highest peak on Lasqueti Island.. Hopefully she will return one day soon with her boyfriend. Just a… read more super WorkAwayer! Fabulous! Marthe stayed with us for over a week in September of 2016 and quickly proved herself to be one of our favorite WorkAwayers of all time. She did her country proud and was an important team member, even getting promoted to Water Manager on her second day. Even the savage seas could not damper her adventurous spirit, although she would not enter the… read more cave. After a night spent on the top of Lasqueti Island's highest peak, Mount Trematon, she did come close to breaking Rule #1: Don't Get Hurt. That was a close one! Marthe was definitely one of the WorkAwayers that we were sad to see leave and we hope she returns one day. Kelly stayed with us for a week in August of 2016 and we found her to be a reliable, conscientious and hard worker, perfectly capable of completing any task we assigned her; gardening, shoveling, heavy lifting, working at heights, night ops, naval operations, keeping secrets, Kelly was daunted by nothing. Her unique wit and intellect fills her… read more delightful conversation with wisdom and knowledge. 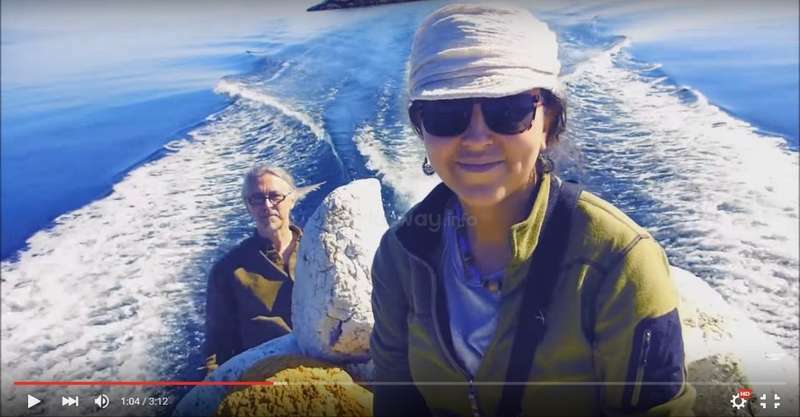 We all hope she returns soon for another close encounter with the baby seal that she had the 'moment' with, and the river otter wants to take another look at Kelly after hearing about her reaction from the seal. We had the pleasure of hosting Shannon for about 10 days in late July 2016. If there was a rating higher than Excellent, we would award it to her. Natural creativity and positive energy flows from Shannon and she gladly shares it will all around her. Truly an exceptional human being. Her legacy will live on, here on Lasqueti Island, for many… read more years. Agile on the beach and forest trails, adventurous and courageous on the high seas, Shannon is a very capable young lady indeed. We were impressed by her natural helpfulness and meticulous attention to detail, thus proving that she is a very intelligent and insightful person. You don't meet people like Shannon often, so if given a chance to host her, our advice is not to hesitate and immediately take the opportunity to experience the wonders of Shannon from Chicago. Gerry's may throw you for a loop (or two, if you're lucky... on a good beach comb). Come prepared, open,… read more ready for surprise, and you will leave with a full heart, strong legs, and (even, perhaps) a deeper sense of home. *By all means, make time for an overnight hike to Mount Trematon. You will not regret it. Maddie stayed for over a week in July 2016 and we were impressed! We found her skill of safely working at heights very useful with the construction of our cedar shake roof. Maddie proved that she is fearless on the Climbing Tree as is now co-champion; she was able to touch the marker near the top of the Climbing Tree, but not move the marker… read more higher to become the solo and undisputed champion of the Climbing Tree. Neat and tidy in the kitchen, a fabulous cook, and a great team member rounds out Maddie of one of the best WorkAwayers we have ever hosted. She's welcome back anytime and we hope she does return one day. Both Caroline and Michal stayed with us for over a week during July 2016. They were valuable and enthusiastic members of our team; one of the most productive teams to date! Not only did they work hard and get a lot done, but they both entertained us with their musical talents and unusual musical instruments, like the music bowl and water phone.… read more Awesome! Especially the pitch-black music deep inside the cave. Caroline and Michal are both intelligent and fun-loving people and are welcome back anytime. Pretty, pretty, pretty good creamy people. Josh stayed with us for almost 2 weeks in July of 2016 and we were impressed with his physical strength and commitment to completing every task assigned to him, no matter what it was. He worked very well as part of a team, or solo. Josh sure can mix a mean batch of concrete, or do any other hard labor job you have for him. Great guy and great to… read more have around. Hopefully Josh will return again one day, during his world travels. Happy journey Josh! Verdict - Visit Gerry's place! Lasqueti is a fairy tale island where people try and live in harmony with mother nature. Gerry completes this ferry tale with his charmingly eccentric personality and equally charming tales of his adventurous life and time on Lasqueti. Gerry's has the mentality of why buy something when you can find or make it… read more yourself? One method of finding materials for his house is beachcombing the surrounding islands, effectively cleaning up other people's litter and then using that litter for something meaningful. His building style is refreshing in its simplicity and by that, I mean things are built simply and in turn simply maintained and repaired later on. Working was always fun and educational and the days went by quickly. Most mornings were spent working, the afternoons spent napping and/or reading and the evenings spent exploring the island. I plan on returning in the future. Thanks again Gerry, for the week of learning and adventure! Stephanie stayed with us for about a week and we were very sorry to see her leave. She's an intelligent, talented and delightful young lady with great attention to detail, willing to undertake any job you can throw at her, and has a fantastic attitude about everything. Stephanie is one of those types of people that notices things that need doing,… read more and just does them; without even being asked. She is a very special human being; something you will notice immediately when meeting her. If Stephanie asks you to host her, our advice is to accept her without hesitation. Truly an exceptional person! I had such a good time on Lasqueti Island. For me, Gerry is a true mentor, humble and cheerful at the same time. He made me realize that every human being can get the work done if they have the good technique. Its not about strength, its about take your time to get the task well done. Justine stayed with us for just under a week and what a pleasure it was to host her! We didn't want her to leave and are hoping that she will return again some day soon for a longer stay. Justine didn't shy away from any jobs she was assigned and was perfectly at ease with camping in the forest and our somewhat primitive facilities; proving that… read more she is tough and versatile. She's very enthusiastic, artistic and contributed to our team effort in many, many ways. Lasqueti Island needs and wants more young people like Justine. We miss her already! Valentin stayed with us for almost a week. We were impressed with the speed of his work, especially when using a wheelbarrow or any other hard labor task. He also has good attention to detail and followed instructions carefully. Valentin worked very well as part of a concrete pouring team, and also worked well on solo projects too. The… read more somewhat-primitive conditions here didn't bother Valentin and he adapted to nature and his surroundings well. Valentine gave us the impression that Austrians are tough. Unfortunately Valentin had to leave early, due to a previous injury, but is welcome back as soon as he heals. Gerry is an amazing host. He makes you feel welcome the second you set foot on his property. He has an enthusiasm that is in infectious and makes you really enjoy your work. He always has a story to tell about some of the most remarkable things. I could not have asked for a better workaway experience for my first time and was disappointed I had to… read more leave. I would highly recommend the Lasqueti experience on Gerry's property. Eddie stayed with us for over a week and worked on many important projects with enthusiasm and gusto. He worked well solo, as well as part of a team. His cooking skills (and cleaning) are second to none as we found out when he cooked many delicious meals for the entire team. Eddie was able to adapt to nature and our system of doing things quickly… read more and was usually the first one up in the morning. Our somewhat-primitive accommodations didn't phase Eddie, and being Australian, he was able to cope with the insect life with ease. He rose to any challenge and excelled at everything he did. He set the bar high for future WorkAwayers to strive for. Eddie did his country proud! He is welcome back at any time! Staying at Lasqueti was an adventure, sleeping n the woods, working in the woods, i loved it. We had a lot of freedom and had to learn to help one and other, which was nice, sometimes challenging. I loved to meet the wildlife and the housecat is a wild one. Sitting with her and making fires in the stove, contemplating love was great! Gerry is a nice guy, he gave us a lot of responsibility, and freedom which i like. Thanx Gerry, i already miss the place after one day! This was my first workaway and a fantastic one! Life on Lasqueti is very interesting and I really enjoyed peering into life off the grid. Prepare for an experience that's very different to what you're used to, but extremely welcoming and rewarding. Gerry is a great guy who was helpful and shared lots of stories and experiences; good company! Rachel stayed with us for over a week here on Lasqueti Island and was a great member of the team. Her attention to detail was particularity useful and Rachel was quickly promoted to Head Gardener. She quickly overcame all of the challenges of living off-grid and surprised all of us, including herself, I think. Rachel really added to the overall… read more well-being of the team as we built the aptly-named WorkAwayer Self-Watering Garden Expansion. Enjoy that hot shower back in civilization Rachel. You deserve it! Claire proved herself to be an interesting, entertaining, and resourceful traveler and a perfect addition to the team. She's tough, strong and likes to get into a job until it is done. She took to splitting firewood with an axe like a duck to water! Her firewood stacking is second to none and she can handle a shovel (goon spoon) like a pro. Great… read more enthusiasm too! With her posh UK accent she could easily be mistaken for a leading character on Coronation Street! Her curry dish is fabulous and Claire helped us realize that British food is really great! Great Britain! Alex stayed here on Lasqueti Island for over a week and was able to handle the somewhat challenging conditions of living off grid rather primitively with ease. Being Australian, Alex was not intimidated by our local spiders, jellyfish, or any of the other curious wildlife that live here on Lasqueti Island. He did his country proud (Australia) and… read more made a heroic attempt at becoming the champion of the climbing tree. He's particularly proficient with a wheel barrow. Alex is welcome back to Lasqueti Island anytime! Well done! Louise stayed with us for over a week and we quickly learned that Louise is a very capable young lady. She has a very pleasant attitude and didn't shy away from any challenge we put before her. She bolstered faith in today's youth and we only wish more 18 year-olds could be more like Louise. We would be delighted to host her again anytime. Wait… read more until you try her world-famous French cake! Finn & Sean worked hard, completed difficult tasks, and followed instructions well. If you need heavy things moved, firewood stacked, material shoveled or wheelbarrowed, then Finn & Sean are the young men of choice. They were eager to learn new skills and didn't shy away from any hard work put before them. They worked well either as a team, or… read more solo, and projects were finished unsupervised. Assign them a task and watch them go at it! Thanks so much Xavi! We very much enjoy hanging out with you! You fit in so well and we will always remember your delicious meals and all the help you gave us. Thanks again and please come back anytime. On Lasqueti you will always have a home. hEY THERE! i feel very proud to say that I was one volunteer in that place with you guys! I'm happy to know that finally you became part of the workaway family! I want to encourage all the people who is reading this project to go there, is a magic place! the forest around... breathe! and roxan, sean and gerry are so welcome people! as well the… read more island is especial, the community is unique in the world i would say ! we ate vegetables from the garden, and i could cook for them most of the time, but just because i loved it! they are open minded and i could help doing what i liked..
nature, nature and nature! if it's what you are looking for... go there! good luck with your project guys! !